Health sharing is new to most people. This will be less so with each passing open enrollment and round of rate increases. We're already at the point where many people without a tax credit are deciding to go without coverage at all. They have been sending a check to the IRS up to 2.5% of their income. Might there be a better way than paying for other people's tax credit? Not only can be avoid the 2.5% tax penalty, but we can actually get protection for health care expenses. First, we need to understand what this new (but very very old) option is but also, which company is the best version of health sharing. The information on the internet is sparse. We need a more comprehensive comparison and review of the health sharing companies so that people can make a good decision. Let's first touch base on what health sharing means? What is health sharing for health care? Before we jump into the comparison of the major health sharing ministries, let's give a quick intro. Let's take a top level look. The ACA law changed the entire health insurance market place in 2014. There were many protections that helped some people and rising costs that hurt others. If you get a tax credit based on income, you're generally happy. If you don't get a tax credit, your costs have roughly doubled or tripled. Those are the people most interested in health sharing options. In that same ACA law, there was a carve out from the tax penalty stick for not having health insurance. They were called health sharing ministries. These are NOT insurance plans. They are memberships that allow members to share health care costs. There are pros and cons to this method and it doesn't work for everyone. The real benefit of the health sharing companies is cost. They are generally much less than the Bronze ACA plan (if no tax credit). In addition, they provide a certain level of protection for catastrophic health care needs. 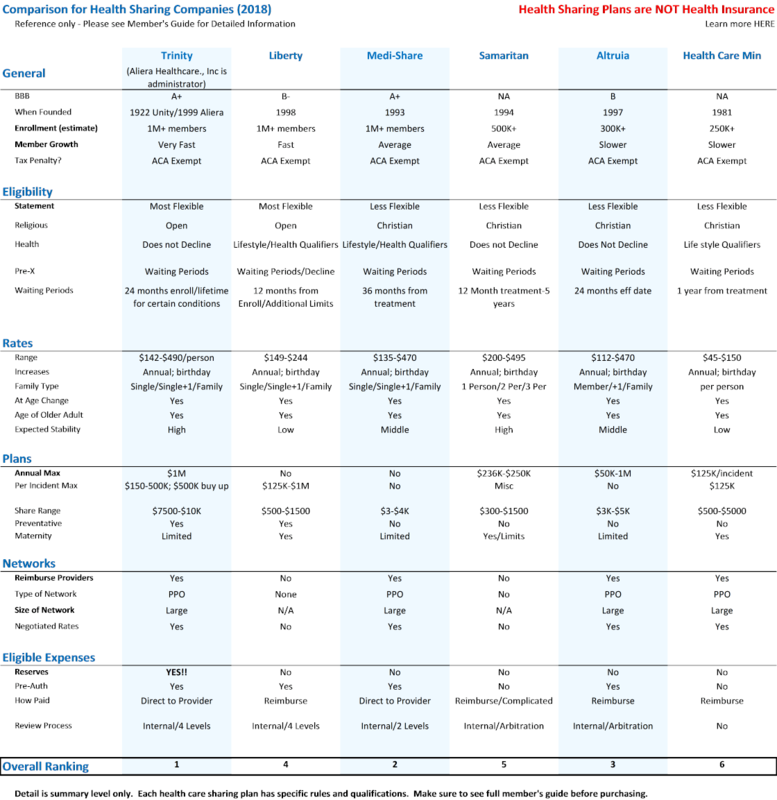 Again, you can read quite a bit with the other articles but here are the bullet points of pro's and con's for health sharing companies versus health insurance (ACA plans). 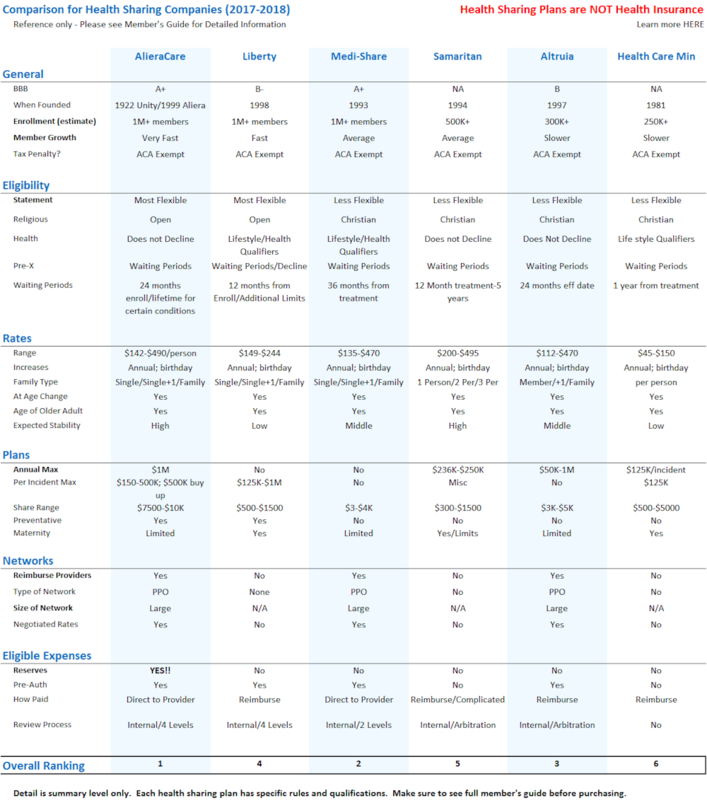 This comparison depends on which health sharing plan we're looking at since they're very different. So let's get into the comparison. In the ACA law, there are specific requirements companies must meet in order to ACA qualified to offer health sharing plans (and the tax penalty avoidance). So which companies made this small list? There are only 6 that are ACA approved which is important since it means you won't have the tax penalty. There is not a standardized plan or offering. THAT'S why we need to compare them! One note...you may ask why ministry? On the surface, the carve out in the ACA law for this type of plan was originally based on religious opposition to the ACA requirements. It really differs from company to company but they all have version of religiosity in their eligibility. This will be part of our comparison below. 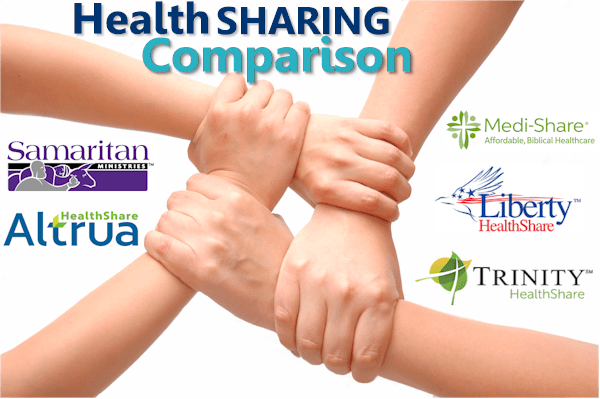 We're new to the whole health sharing world and we want a comparison of the 6 companies. There are a few to focus on which we will note as we go through them. Let's discuss the grid highlights...the most important items. From our standpoint, the two most important items under general are BBB and Enrollment. All the health sharing plans listed allow you to avoid the tax penalty. They all have the same requirements in order to be ACA exempt. The BBB review is important. The Enrollment number is even more important! This comes from 20+ years in the health coverage business. Health sharing is similar to health insurance in one key respect. We're spreading health care expenses among a pool of people. The larger the pool, the less chance of the company having financial issues. If someone has a heart attack and it's $100K, we want to spread that over 100,000 people. It's only $1/person that way. For that reason, AlieraCare Plans (Trinity Healthshare) and Liberty are the leaders there. 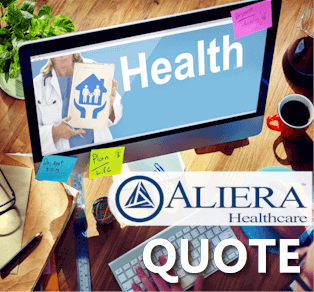 Aliera Healthcare, Inc. is growing very quickly and we really expect them to be the dominant force in the health sharing segment for many reasons (which we'll get to). You will avoid the Obamacare "mandate" or tax penalty with any of the 6 health sharing companies. This section becomes more important with health sharing plans. 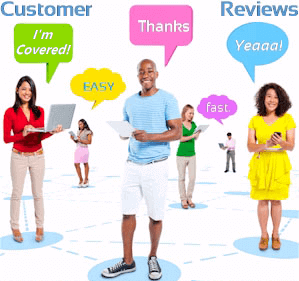 Each company has different ways of addressing the ability to qualify for coverage. In terms of the required Statement. The original health sharing carve out was based around religious or ethical belief. Let's look at the key points here. This is the statement an enrollee must agree to in order to qualify. Of the 6 companies, AlieraCare plans and Liberty are the most flexible. AlieraCare plans (via Trinity Healthshare) have a simple 5 point statement rather than a religious requirements (Christian, etc). Liberty health is next in line and the others become more strict in who can qualify and what is required of them. We are talking about health care so what about health qualification? Let's look at health...that's a big one! Some of the health sharing companies will decline coverage based on health and/or even lifestyle choices! AlieraCare plans will not decline due to health. They have waiting periods for pre-existing conditions but of all the health sharing companies, we like theirs the best. Make sure to read the section on Waiting Periods for ANY health share company you're interested. Get the Facts! Many of the other health sharing companies have waiting periods from when you have symptoms or treatment which means these periods could go on forever! Medi-Share, Samaritan, and Christian Health Ministries may all have waiting periods for pre-x from last time of symptom or treatment. This ostensibly means that a waiting period could go on indefinitely. Make sure to look at the member's guide in detail to understand how each company addresses pre-existing conditions. There can also be waiting periods for new situations before a plan will share costs. You'll see this for maternity pretty regularly. It can also apply for more serious issues and even preventative. For example, a given company may not share costs for 1st 12 months of membership towards certain conditions or treatments. This is the health sharing answer to the Open Enrollment requirement for ACA plans. You can only enroll at the end of the year or with Special triggers. Health sharing allows you to enroll any time of the year but there will be waiting periods for pre-x and certain conditions. People knowing they have an undiagnosed issue and getting coverage to address it. That would destroy the monthly costs of either program. Personally, we would rather have coverage for other issues (car accident, etc) that might arise while waiting for the the waiting periods than having no coverage till Jan 1st (ACA plans). Again...narrow down your favorite and read the membership ship guide (links above). It's best to think of the health sharing plans as more catastrophic coverage in nature. That is what many people are looking for anyway! This section is really really important. And not in the way you think. Yes, we need some relief from the ridiculous Obamacare rate increases (if you don't get a tax credit). Health care COSTS are high! Through the roof in fact. A simple outpatient ACL repair can run $15-20K. Some of the health sharing companies have pricing out of step with what the plans say they cover. We've been in the health market for years and we've seen how this plays out. Either those companies are not paying on expenses (yet) OR they're going to have serious financial issues. This is probably the single biggest reason we'll only deal with AlieraCare. We don't want the calls where a company goes under and a person's in the middle of a serious health issue. That's invariably going to happen with some of the member share rates these companies are showing. Look...the health sharing plans look very similar to what we had before Obamacare. Waiting periods. Certain restrictions. Lifetime limits. Etc. Yes, they are not insurance (very important distinction) but the core feel mimics what we used to have. The rates should also mimic what we had before. The rates before Obamacare were about 1/2 to 1/3 what they are right now. This means a $7500 health share plan should be about 1/2 what the Bronze ACA plan is now. Some of the health sharing plans are way under this. There's a serious mismatch in their pricing and what you're expecting them to protect from. This leaves AlieraCare, Medi-Share, and Samaritan as more reasonably priced to actually survive AND protect you. If your health share plan isn't paying for reasonable medical expenses, why get the membership at all? Again...we've had decades experience on this front. Companies that have pulled of the market leaving people stranded. Companies that wouldn't pay for treatments. It's a horrible place to be. We're already talking about health sharing where there is not Department of Insurance backstops of guarantees of payment and solvency. You want the safest, cheap car in this race. For that reason, we come back to AlieraCare. Medi-Share and Samaritan have too many requirements and restrictions. Christian health ministries is just not ready for the major leagues in this space. Liberty is way underpriced. That's going to end badly. Lean on our 25 years of experience and avoid the potential for tremendous hardship. Again, it's better to pay the monthly amount then to have a questionable company. We're happy to discuss the rates at 800-320-6269 or by email. They will all have annual rate adjustments and when the oldest person moves to another age band, the rate will increase accordingly. All the companies offer various plan options. We listed these in order of importance. 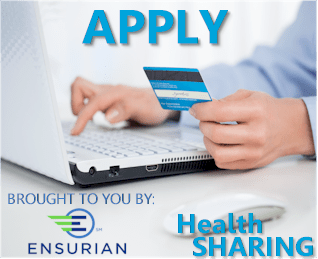 The Member Share Amount is the health sharing equivalent of your deductible. It's the amount you'll pay before the eligible expenses are then shared. We recommend getting the largest per-incident max benefit. For example, we would rather have a higher share amount (such as $7500 or $10K with AlierCare) with the Premium option (highest per incident max of $500K) than the Value or Plus options (lower per-incident). Remember, the whole reason we're getting coverage is for the big bill. If maternity is even out there in the ether, we would actually recommend an ACA health plan for at least the mother. You can piece meal it and get ACA plans for mom and health sharing for dad or other family members. Maternity can be a very big bill. $90K for my first born and $150K for 2nd (both healthy and somewhat happy teenagers now). Remember...it's the big bill we want protection from. The mix and match option seems to be the most popular with mom on ACA and dad on health sharing. It's nice to have and really, the goal is to avoid health issues by being proactive. The health sharing plans all have various takes on this approach as it keeps costs down for everyone. AlieraCare Plans (Trinity Healthshare) and Liberty have full blown preventative benefits built in (waiting period for routine physical) while others do not cover it at all. You're probably talking about $200-300/person per year in benefits so figure that into your pricing. RX is a consideration with health sharing. Most have discount RX cards as part of the offering. Christian Health Ministries has an RX benefit but see the limits in their brochure. If you have ongoing RX needs, make sure to take that into account when considering health share options. Keep in mind that we can move to an ACA plan at Open Enrollment at the end of each year OR if we have a Special Enrollment trigger (usually marriage, birth, move, or loss of group coverage). This gives us a backup option since we're really only deciding for a maximum of 12 months. AlieraCare (via Trinity Healthshare), Medi-Share, and Altrua all use the large PHCS PPO network. Liberty, Samaritan, and Health Care Ministries do not have a network. It's much better to have a PPO network. PPO essentially means a big bulk discount. On average, just seeing a PPO provider will result in a 30-60% discount. We've seen even bigger discounts for larger services such as hospital. I've personally seen $40K bills drop to $3K. Little known secret but the hospital can write off the difference as a loss. PPO's the way to go. PHCS PPO has 1M+ providers nationwide. With the direction Obamacare networks are going (PPO to HMO, big to small, etc), we even find it to be better than what we can find on-exchange for most people. This is a crazy reversal of fortune. The network changes might be the biggest issue since 2014 aside from the rate increases. That's a checkbox for AlieraCare plans, Medi-Share, and Altrua. The other carriers actually reimburse you for medical expenses. This has proven to be a nightmare (read the reviews). In the meantime, the hospital is asking you for $30k with collections in the wings. More importantly, when you show up at a hospital or doctor, what's the first thing they ask you? "What plan do you have?" Ummm....I have such and such health ministries and they'll reimburse me (maybe). Most hospitals will get you patched up and send you to a county hospital if you don't have a card to show them. With AlieraCare, Medi-Share, and Altrua, you show them your PHCS PPO card! This is really a big deal but most people don't realize it until they're in a bad situation. It can mean having the best providers or not! Which can mean life or death these days. You want the network and you want the PPO card to show them when you walk in. This is our second biggest issue with Liberty that most people don't realize. We discussed the rate issue above but we really hear about issues on the back end when a person's at a hospital or provider. 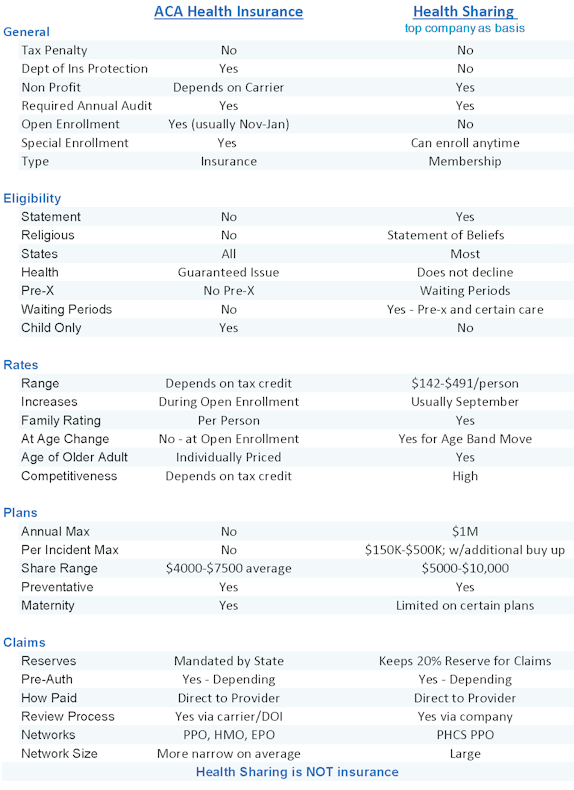 Eligible Expense Comparison for Health Sharing Companies. Keep in mind that health sharing plans are not insurance. By definition, claims is an insurance term. It means another entity is responsible for paying something. Health sharing doesn't have this requirement. This means that we have to pick the best of the lot. Will they pay for big health care costs if the come? This is what makes us very leery of some (if not most) of the health share companies. The amounts charged are too good to be true IF the company will actually pay out for health care needs AND remain financially viable. That's Liberty, Medi-Share. And Christian Health Ministry. We're happy to walk through the rate versus stability question directly at 800-320-6269 or by email. The other is issue deals with process. It's all good to evaluate plans on paper but what about when you're in the doctor's office. This process with the PPO card and reimbursement to providers feels much more familiar to everyone involved. We're already going off the beaten path with health share. Let's keep what we can familiar! We looked at health sharing in general. Finally, we brought out the big guns...the comparison. We picked the most important elements for people new to health sharing to compare. This is based on 25+ years in the health care market. We speak with people both choosing and using health care every day. We know where the issues are and what to avoid. Those are the big ticket items. There's only one health share company we would even consider for ourselves and our family. Look...the goal is to avoid the ridiculous rate increases with Obamacare plans while also dodging the 2.5% penalty from the IRS. We obviously want to keep rates as low as possible in this endeavor. That being said, don't overlook the bigger issue. Why are the rates going up so quickly for Obamacare? Yes, there's every mandate under the sun but the cost of health care has also exploded! There are real financial pitfalls to avoid so we also want a health share company that has some staying power. The best chance to be the dominant health share plan a few years out. Based on pricing, process, and size trajectory, we see them dominating this market. We won't be surprised if 1-2 of the health share companies have financial issues and another 1-2 have significant rate changes. They're either underpricing their plans or they're too small to survive any real expenditure. You don't want to be caught in either situation. We're happy to walk through any questions you have at 800-320-6269 or by email. 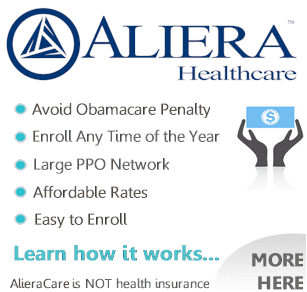 You can check out the AlieraCare plan rates here and even enroll in AlierCare plans online here. Also, our Guide is in-depth on how health sharing and AlieraCare. work. Great resource to educate yourself.